Trek is one of the biggest, most trusted, bicycle companies in the world. 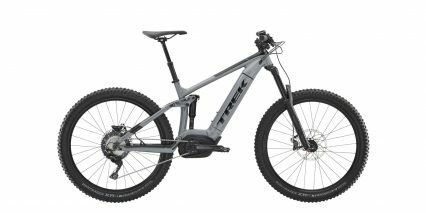 Since ~2003 they have been developing ebike systems and I first saw them enter the US market around 2015. The bikes they put out are usually purpose-built around custom frames, available in multiple sizes that use leading components and come with excellent dealer availability and support. You get what you pay for, but that means their electric bikes tend to cost more… The Verve+ aims to lower the entry point price wise, without sacrificing a lot of feature. To be honest, it’s my favorite model in their line right now! This thing isn’t the fastest or most powerful, but it is extremely lightweight at ~45.6 lbs (especially considering that it has aluminum alloy fenders), and it’s very comfortable and safe. Trek marketing told me about their ABC’s campaign (always be seen) and I definitely noticed the integrated lights and shiny metallic color schemes with white accents. 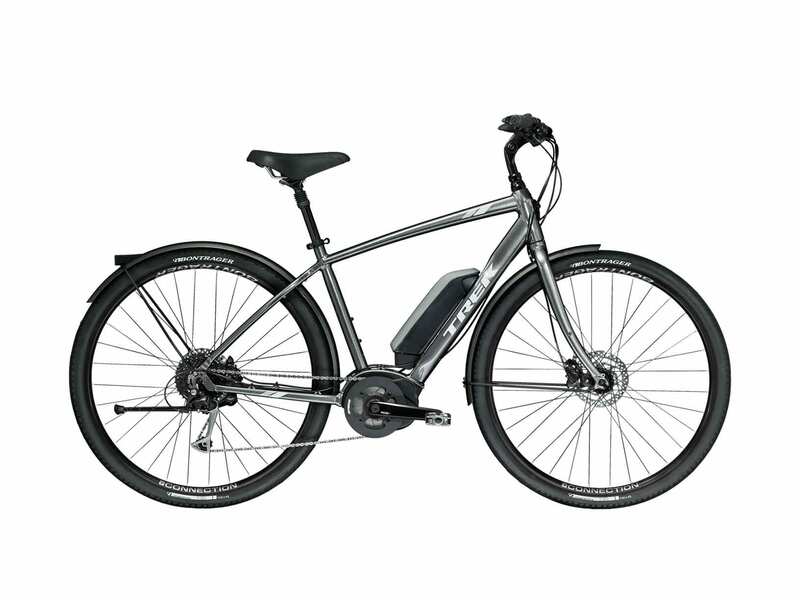 This is a neighborhood / city oriented product with efficient hybrid tires and upright geometry. It allows you spot for traffic while staying visible, and I would recommend a light colored helmet and reflective clothing if you do plan to ride through traffic regularly, especially at night. 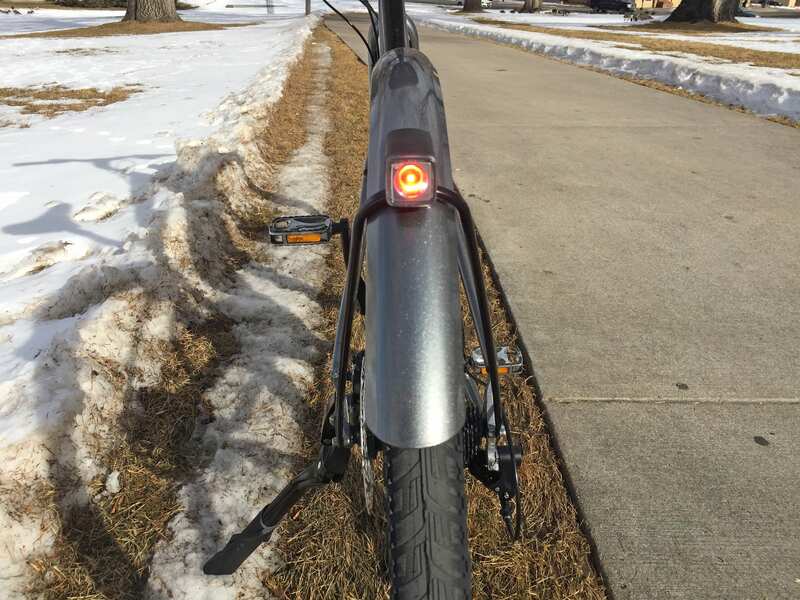 The headlight produces 400 Lumens, which is very bright, it’s aimable to let you see where you’re going as well as be-seen, and the rear light produces a strobe flash pattern that is attention grabbing. 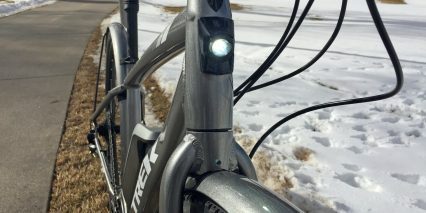 So many e-bikes use basic lights that aren’t bright and don’t flash… but there is one compromise here. 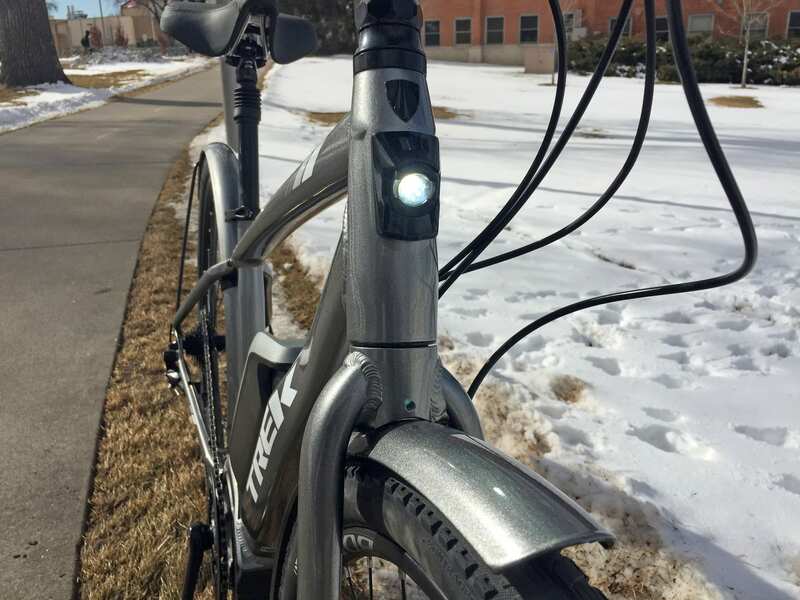 The headlight is built into the steering tube vs. mounted to the fork or handlebars, and that means it doesn’t aim where you turn, it just goes straight. Given the toughness of these lights, the fact that they run off of the main battery pack, and the option of adding your own aftermarket light on the handlebar with the Blendr plastic mount… it’s not the end of the world. Let’s say you’re someone who might get groceries occasionally or commute to work with a laptop and other gear. the Verve+ will not only keep you dry and seen, but it can help sherpa your load because it has bottle cage bosses and rear-rack compatibility. 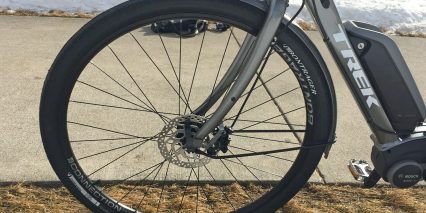 I was told that it supports the Bontrager (a Trek brand) BackRack Disc which can be found here. 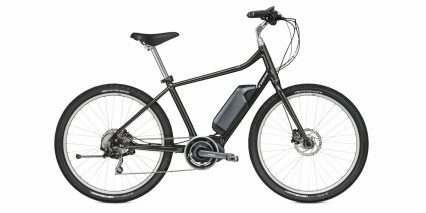 There’s so much to say about this electric bicycle, even though I was given a grey high-step frame to test ride (because I’m a 5’9″ guy) there’s also a mid-step grey frame that would be easier to mount and stand over… and it looks pretty masculine. For those who like the bright fun colors, there’s a bright red option in step-thru as well. The tires are a bit wider and softer than average, which provides stability, and they have puncture protective layers to help reduce flats. 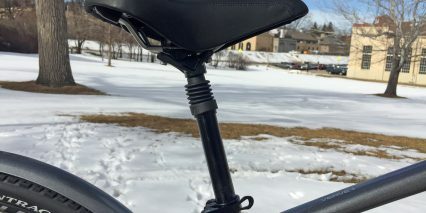 I was able to ride around Fort Collins, Colorado through some snow, puddles, grass, and bumpy sidewalks without issue, even riding with no hands to test stability. The bike works great and is very quiet and smooth. Part of what makes the Verve+ lightweight, efficient, quiet, and smooth is the base-level Bosch Active Line Cruise motor. It’s rated from 250 watts to 295 watts and can deliver up to 40 Newton meters of torque. Mid-drives tend to be more powerful in practice than their numbering portrays, because they rely on your gears to maximize torque or power. 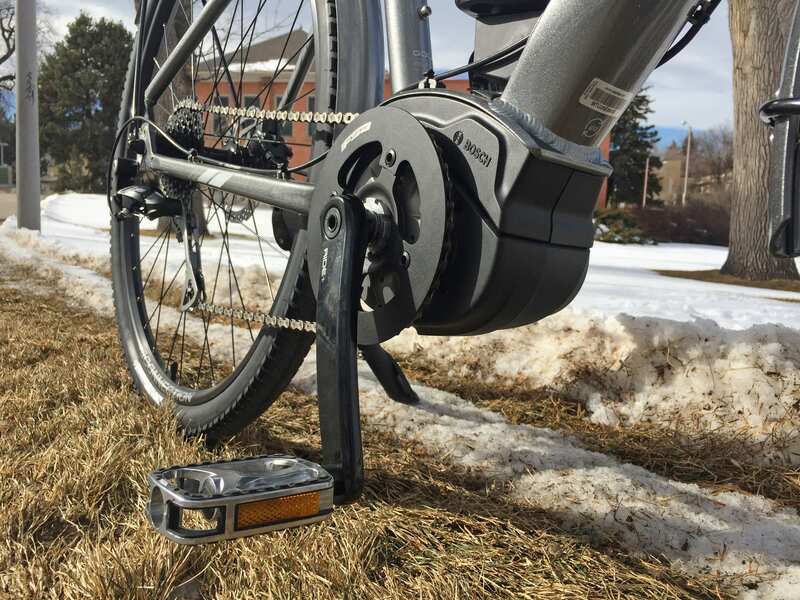 If you shift to a lower gear, not only will it be easier for you to pedal, but the motor will also get a mechanical advantage and have an easier time. 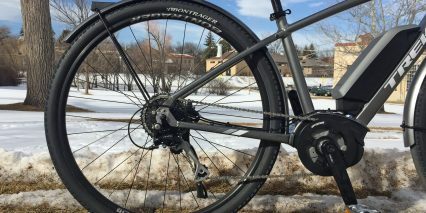 The 9-speed cassette offers more than enough pedaling options for urban use and the mid-level Shimano Alivio derailleur is crisp and reliable. Unlike some the off-road and high speed motors that Bosch produces, the Active Line and Active Line Plus have a one-to-one chainring that does not require a reduction gear. 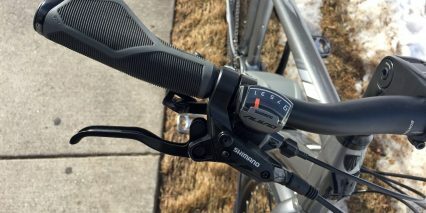 This means that there is no friction if you decide to pedal with the bike powered off, or if you work hard and pedal beyond the top assisted speed of 20 miles per hour. As a Class 1 electric bicycle, this bike is allowed in the most places, and is treated as a bicycle vs. a moped, so you don’t need a license or insurance to ride. 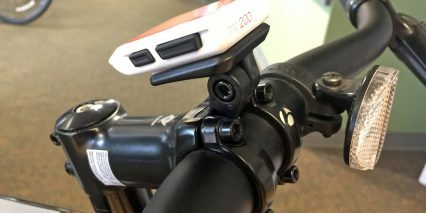 Trek has gone out of their way to disable the walk mode feature that Bosch usually offers, in order to avoid having regulators and cyclists feel like there is any kind of throttle support. I admire their purist bicycle background, and I feel that this motor choice is perfect for the Verve+ platform. Trek has many other city or hybrid city+trail models worth exploring, but they all weigh more and cost more. When you’re able to go from an 8.8 lb Bosch Performance Line motor to a 6.4 lb ActiveLine, and you make some compromises on the battery, display, and are able to produce ultra lightweight hydroformed aluminum frames… you get a good end result. 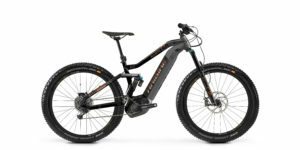 And so, the battery on this ebike is also lightweight, because it is one step down from the higher-level Powerpack 500. Bosch has been offering the Powerpack 400 since ~2013 in the United States, and it is highly trusted and appreciated by all of the shops and end-customers I have visited with over the years. There aren’t really many compromises to discuss here, except that the battery is visually obvious on the frame. It looks great on the Antracite Grey frame I was loaned for this review, because the top portion of plastic is grey… but it doesn’t blend in quite as well on the Coral Red or Deep Dark Blue. People might not be able to hear the motor, or even see it very well behind the standard 38 toot chainring, but they can see the battery. The upside however, is that the pack is easy to reach for charging and safer to mount and dismount. Yes, you can take it off to reduce weight of the frame or to charge it separately (away from extreme cold and heat if you can help it). This pack has a nice big loop handle at the top, making it easy and safe to carry. 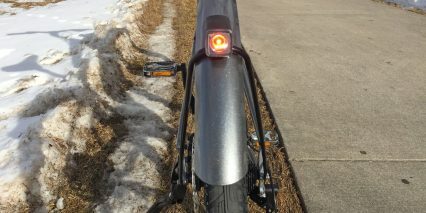 It has a little 5-LED power indicator on the left side, so you can tell if it’s charged up before mounting to the frame. And, it uses the same proprietary plug design as the mount, which means you don’t need to keep track of special adapters or extra wires. 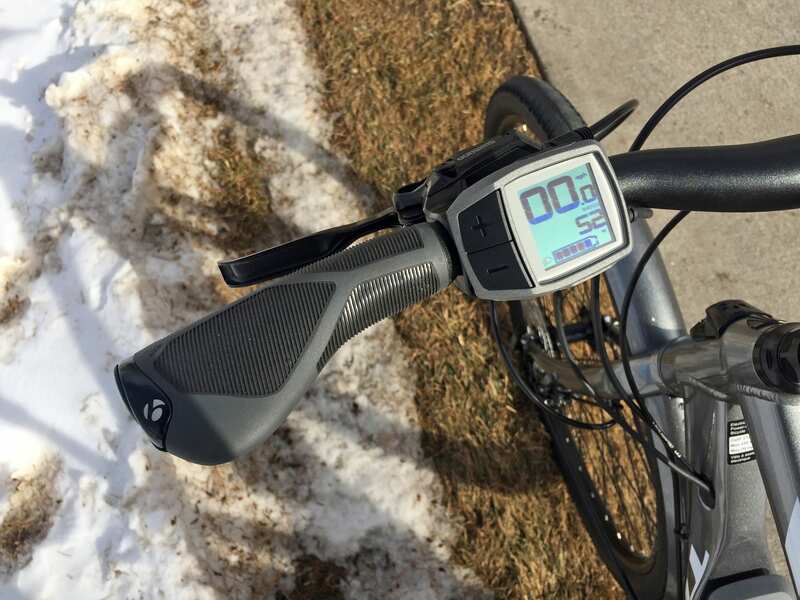 The motor, the battery pack, and the charger for this bike have all been specced down just a bit, and what that means for the charger is that it puts out 2 Amps vs. 5 Amps and may take longer to fill this 396 watt hour Lithium-ion pack. Something like 5.5 hours from complete empty, but the first half fills much faster than the last because the cells aren’t being balanced as carefully. You can extend the life of this battery by keeping it around 50% full when not using for months on end. 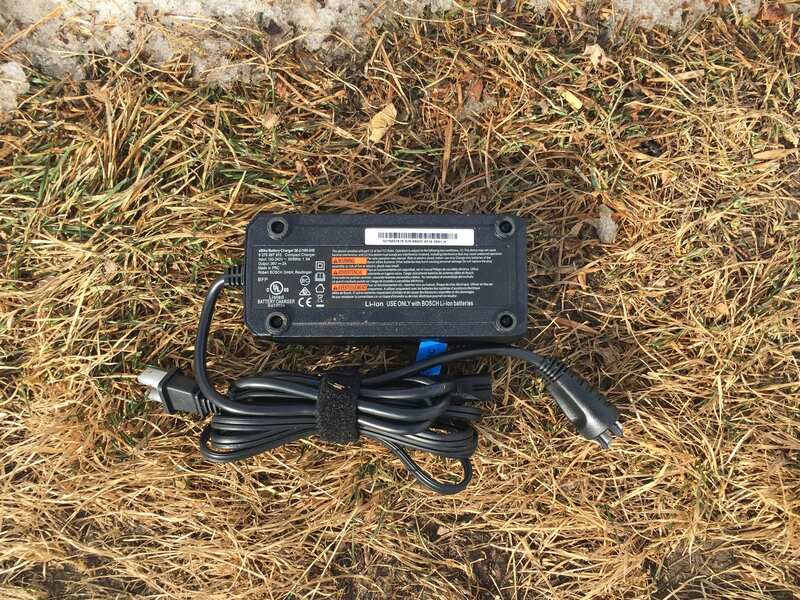 And, if you break, lose, or simply run the battery completely dry after 1,500+ charge cycles, you will easily be able to find a replacement… or even upgrade to the 20% higher capacity Bosch Powerpack 500, because it’s built into the same case design, and fits into the same mount. 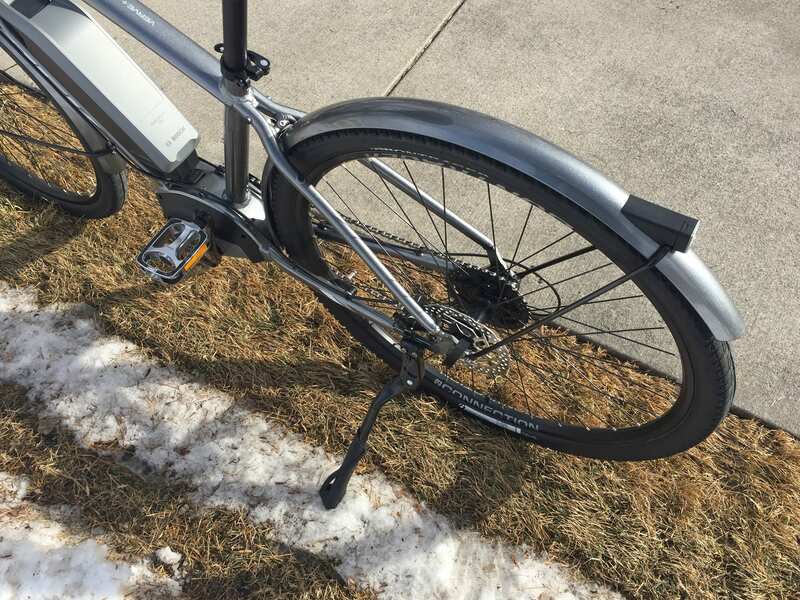 Finally, a word of caution, if you are charging the battery on the frame, be careful not to move the crank arms because the charging plug enters near the left crank and could get snagged or bent. Operating this bike is pretty simple, and fast. Once the battery has been charged and mounted, you can press the little minus sign on the left side of the battery or press the power button on the top edge of the compact display panel. This display is called the Purion, and it’s usually found on less expensive Bosch powered bikes or mountain models, where they want a sturdier and less obvious display. It’s not as large as the Bosch Intuvia, does not swivel, is not removable, and does not have an active Micro-USB port… which is sad, because that can be useful for maintaining a phone or other portable electronics, and there is a port, but it’s apparently only used for diagnostics by the shop. Even though we are already dealing with the lower capacity battery, and it’s running the lights here, it would be nice to at least have the option to charge mph phone for GPS while I was riding. Perhaps Bosch will offer this someday? Other than those gripes, the display is actually really good. 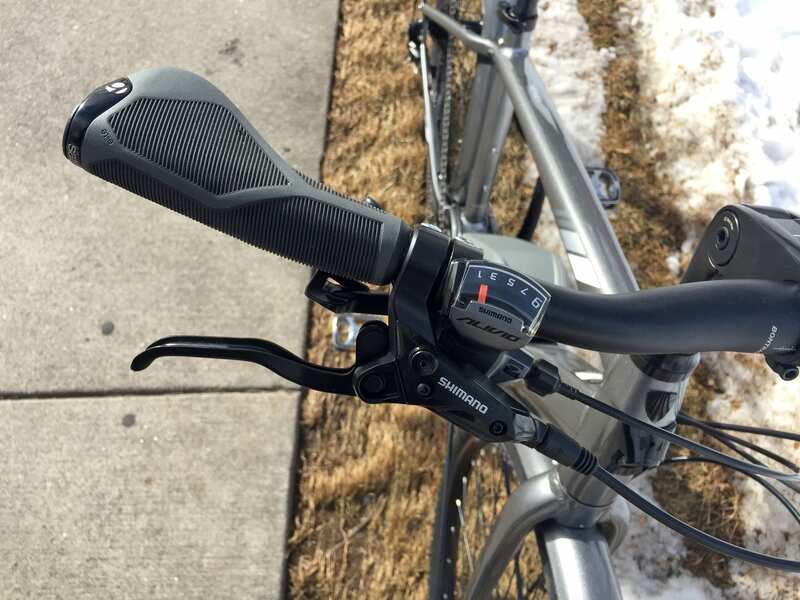 It’s positioned within reach of the left grip, so you can click the + and – buttons while riding to raise or lower motor support. There are four drive modes: eco, tour, sport, and turbo, and they increase both the starting force and zip feel as well as the maximum supported speed. If you’re riding for fun, or maybe through a crowded area, the lower levels can be very satisfying. I have actually heard some people complain about how other electric bikes feel overwhelming or too fast, but that won’t be an issue here. 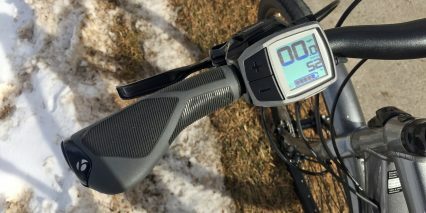 Some of the other features of this display are that it has a faint white glow which is always active and helps it be read at night or in low lighting conditions, it can show your trip distance, odometer, and range estimate by holding the minus key, and it activates the front and rear bike lights by holding the plus key. 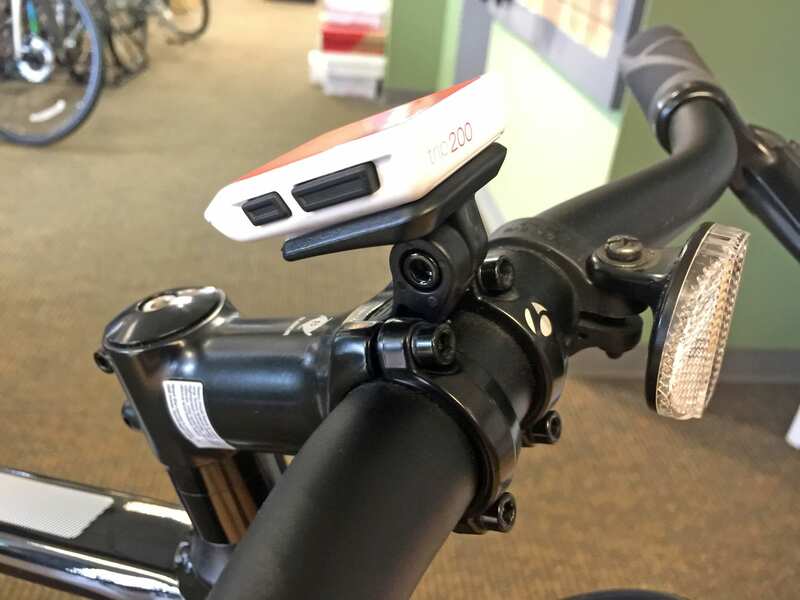 For those who wish to have an even larger display with additional readouts and removability (perhaps for commuting situations), I have been told that some ebike shops will upgrade the Purion to Intuvia for $200+, but this will take up the space where the Blendr accessory mount would otherwise fit on. In my experience, ebikes are the most fun when they are comfortable. 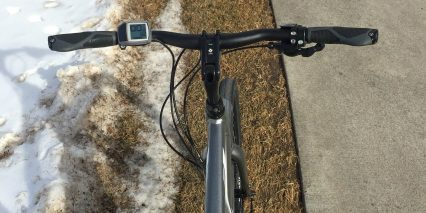 At first, I wasn’t sure what to expect from the Verve+ because it has an all-Aluminum frame with a rigid fork. In practice, the slightly fatter tires, larger saddle, suspension seat post (basic as it is), and adjustable stem, won me over. It feels stable and maneuverable, the lighter overall weight makes it easier to walk with and lift when necessary, and the fenders and lights are so well done. Keep an ear out when watching the video review above, I was amazed by how quiet the fenders were. 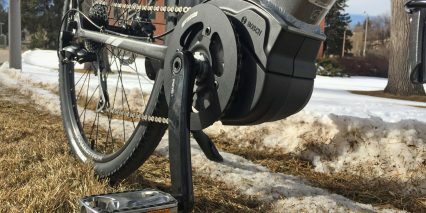 Perhaps Trek could offer a chain protector, to keep your pants even cleaner, but the alloy chainring guard is good enough. I love how frame tubing is molded to look cool, even flattening out where the battery mounts to keep it lower and appear more streamlined. some wires are internally routed, but not all, and I did notice a plastic slap guard to protect the paint on the rear right chain stay. 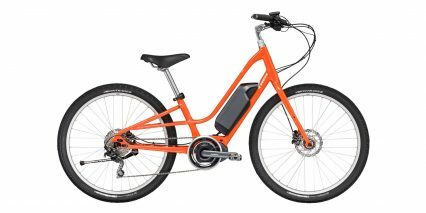 This is an electric bike that could be fun for couples, or “imbalanced couples” where one rider enjoys non-electric cycling and the other stresses about wind and hills or has some hip or knee sensitivity as I do. Yes, the Active Line motor is weaker than some other brands and even some options from Bosch, but it still performs well and can climb. The maximum weight rating for the Verve+ is an impressive 300 lbs, which is above the average 250 lbs from other companies. Considering that this is Trek’s most affordable electric bike, it really doesn’t feel like they sacrificed on the parts that matter (the drivetrain and safety). 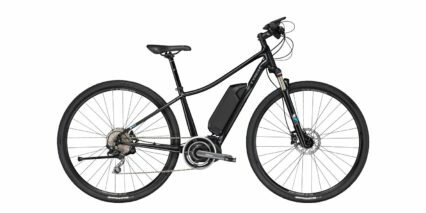 One happy benefit of the smaller more efficient motor here, is that it uses energy slower, and should get 30 to 80+ miles per charge depending on your weight, terrain, wind etc. Big thanks to Lee’s Cyclery in Fort Collins, Colorado for receiving this bike and letting me hang out and review it. And, to Trek, for partnering with me on this post and providing other demo opportunities in the past. 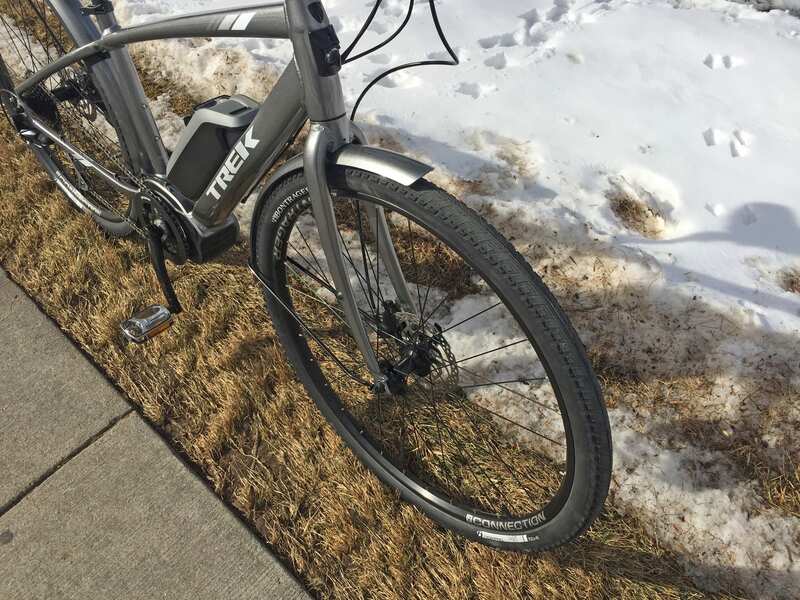 You can explore all of my Trek ebike reviews here and post your comments and questions below, or visit the Trek Forums here to connect with others. Ride safe, and have fun! We bought this model (the step-through version) for my wife and it is super smooth and ultra-quiet. The torque is decent. It’s a great cruiser. It’s also surprisingly light. 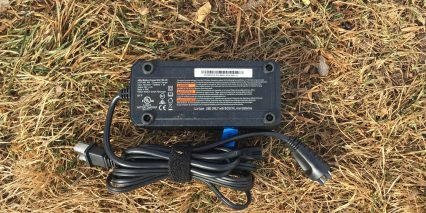 The 400 ah battery pack lasts about as long as my 500 ah pack for my Bulls Six50 which is heavier, faster, and has more torque. But the two bikes are very different animals. The Verve is a street/pavement/smooth trails kind of bike and it’s really hard to tell your being powered by something else. You just feel magically strong. The integrated headlight is decent for a be-seen kind of light and might also do for a seeing light in most conditions if you’re not going too fast. We like the Bosch systems for ease of use and the warranty. Do you think the xm700 is worth the 1300 premium over verve+ if I am riding in boston, hauling groceries. Great review, Court. Based on your review, we bought this bike from a local Trek dealer for my wife recently, and we are very happy with it so far. 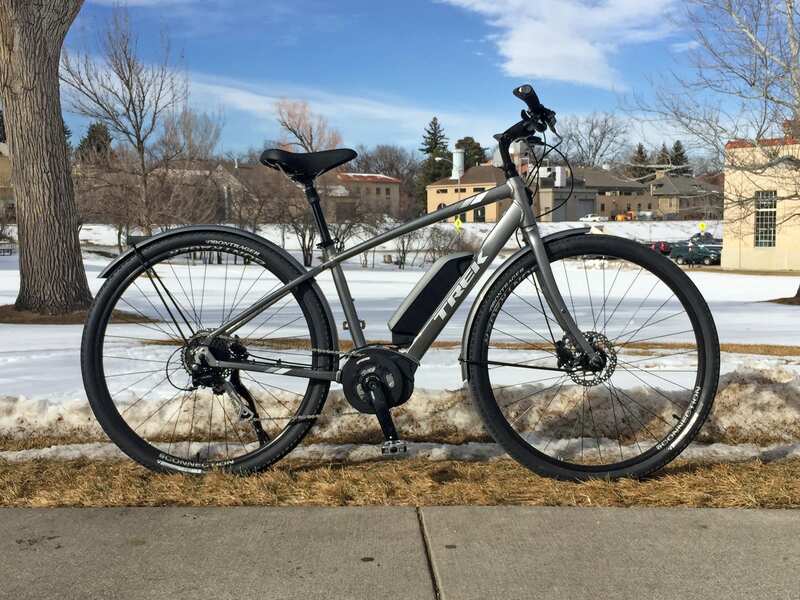 We first bought a Voltbike Elegant online, but had unresolved electrical issues and returned it for a full refund. That experience emphasized to me the importance of local support for an e-bike, as they are definitely more complicated than a conventional bike. Also, for the brief time that the Voltbike Elegant worked, it was way overpowered for what my wife required. I’m also now sold on the smoothness and quietness of the mid-mounted Bosch motor-battery combination as compared to the hub motor on the Elegant. Even though this is the least powerful Bosch motor, my 60 year old wife had no problem beating me up a short, but steep hill this past weekend. Overall I’m impressed with the build quality and the light weight of the bike. Even after adding a rear rack, the total weight of the bike is about 47 pounds. Paid about $2100 for the Verve+ on sale. The extra cost over the Elegant is worth it in my opinion, both for the quality of the components, and also the peace of mind with local support. Hi Roger! 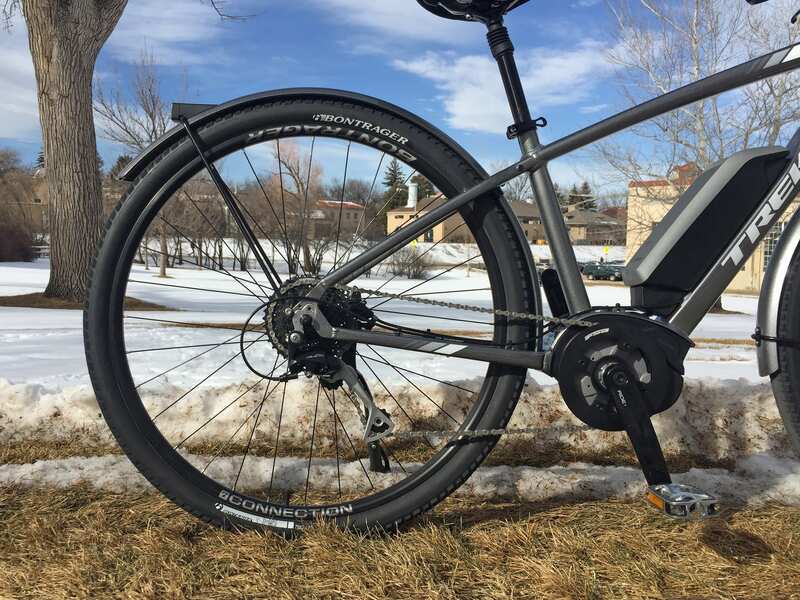 So well said, thank you for taking the time to share your story and include details about how the VoltBike Elegant felt a little too zippy for your wife. 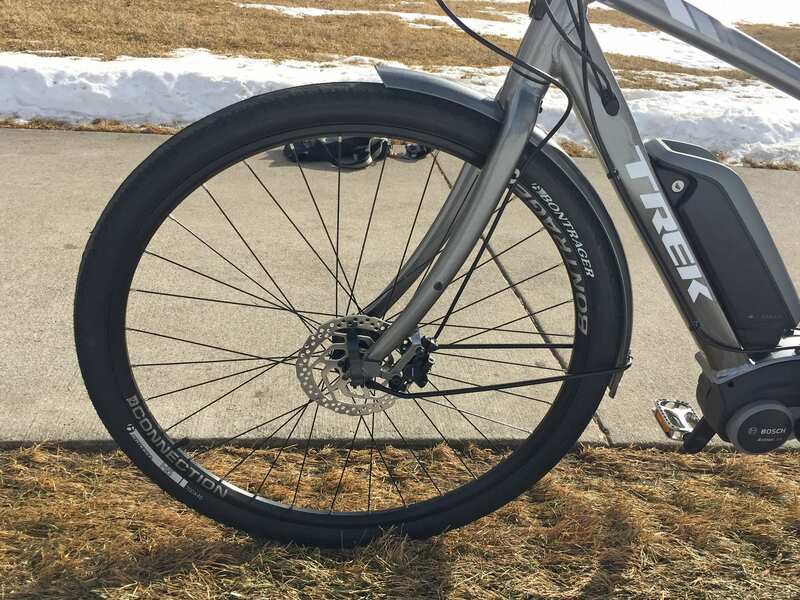 I really love the Trek Verve+ because it uses quality components and feels natural. I’m sure your post will help others who might be weighing the cost savings against the performance and support. Having a local shop makes a big difference :) hope you two continue to enjoy riding together, thanks again! HI Court. Question; We live in a really hilly area and my wife and I both have ebikes currently. Mine has plenty of hill climbing capacity (twin batteries = 17 Ah and a 500 watt motor) but my wife has a simple Yunbike C1 (which is a cool little bike and she has manged to climb some steep grades in it). Do you think the Trek Verve is a suitable upgrade at hill climbing and range capacity? Cool! 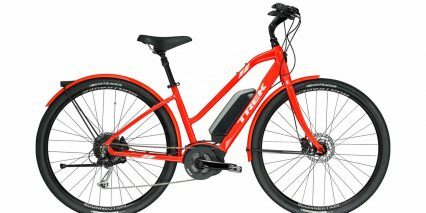 I remember the Yunbike, cute little thing :) yearh, the Trek Verve is going to be more efficient and capable of climbing because it utilizes the Bosch mid-drive. 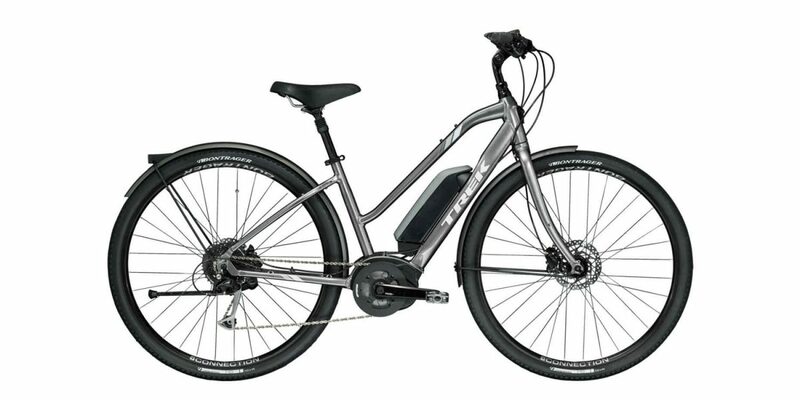 The Trek Verve+ is one of my favorite ebikes in general, great value, and even though the motor produces a little bit less torque than the Performance Line models, it should still work well if she shifts gears down and uses the higher levels of assist for climbing. I’d love to hear how it works for you guys, if you go for it! And, you should be able to find one to test ride at a dealer beforehand, to confirm power, which is nice. Had mine for a week now, it’s great. Everything it claims and more. So I’ll just make a few new observations. The walk mode works (maybe as of 2018). The pedals are 1-2″ higher than on a non + version. That means you need to raise the seat higher for the same leg extension, which can lead to a lesser upright posture. The post below the cross bar (the one that holds the seat post) on my 18.5″ is too short to hold my 24oz polar water bottle. The gearing is the best I have every had. The 9 gears work flawlessly and in conjunction with the 5 (including off) power modes essentially gives you 45 speeds. With the power assist off, it preforms exactly like a non e-bike. The battery holds a charge. (I ride 15+ miles/day with about 5 mile using e assist, and probably only need to charge the battery once a week). I love ergo grips and these are the perfect shape and size, but I find them rough on the hands and also sweaty. One last thing, when I finally found one my color and size, about 50 miles away, I couldn’t decide. This bike shop said I had 14 days to return for full refund. Sure made my decision to buy a lot easier. p.s. non e-related, I wish Verves (and +’s) had the front suspension back. Any suggestions on how to replace front fork with suspension one and where to get it? Maybe from a 2016 Verve, or older Navigator or Shift? I talked to my bike shop and suggested the Paragon too, but now they are saying I also need to replace the stem. Does that seems right? Mid-August this year I purchased two Verve + Bicycles at a local TREK dealer in Mishawaka, IN on sale, I could not pass up the deal. After shopping for about a month and test riding about three other bikes, I decided on the BOSCH mid drive used here. The following weekend, I took them on a family camping trip up north. The bikes performed excellently… on hard packed trails. I’m 63, long time cyclist, now I can extend my range once again. 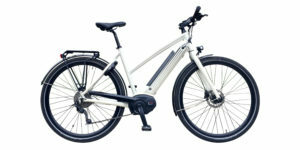 One of best entry-level ebikes on the market… thanks again for your review and professionalism, keep up the good work. Hey Court: A general, but sincere, thanks for your candid and informed reviews – especially helpful to e-bike noob me. 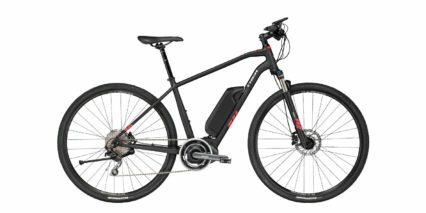 Have watched probably 15 of your reviews while researching my first e-bike purchase, which I’ll make within the week. Am leaning toward the Trek Verve+ step-through after considering similar Rad City and Populo models: the Verve’s 45-ish lb. weight, disc brakes, Bosch system AND local dealer support are calling! Again, truly appreciate your pointing out details and features (both pro and con) that I’d surely overlook if I were buying without your guidance. Ride on – and keep up the good work! Fantastic! I’m so excited for you, Judy. It’s wonderful to be in a position where I can help people and also provide a space for interconnection. 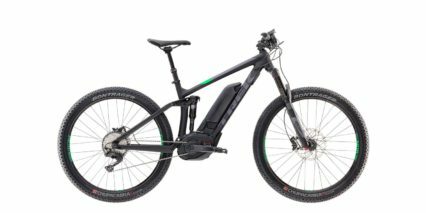 Ebikes are such a positive technology, but I realize they can also be quite expensive. Reach out anytime, hope you have a great day! Hi Court: First, I want to say thank you for your excellent reviews of so many e-bikes. I am looking to move into e-bikes for my wife and I. We are both 64 and would like to extend our riding years and distance. In addition, I will be 65 next month and used to commute to work about 12 miles each way on my road bike (2006 Trek Madone 5.5 CD). I haven’t bike commuted in a few years but would like to bike commute most days for the next couple of years while still working daily. As a Type-1 diabetic for 34 of my 64 years I can confirm that cycling and good blood sugar management has extended my life! We have direct access both from home and from my office to the the beautiful American River Bike Trail which I would ride for about 10 of those 12 miles (no cars!). For me, I think I am most interested in the Trek Super Commuter +7 (Class 1 e-bikes are permitted on the AR Bike Trail). For my wife, I was thinking about the Trek Verve +. She is a fit and active and also rides a 2006 Trek Madone 5.2 triple, but at the end of our rides we have a short 12% (confirmed today with my Garmin) hill leading up to our house from the bike trail. On occasion, if we have ridden over 15 miles, she will need to walk up that hill. She is about 5’3″ and about 130 lbs. 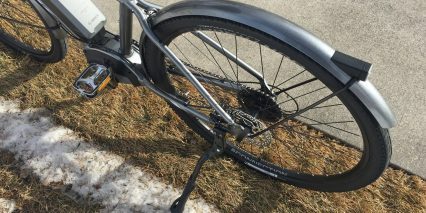 My question is “Do you think the Trek Verve + is capable of assisting her up that 12% grade short hill at the end of a longer ride ride?” She has never ridden an e-bike, but I think if the gearing and power are adequate to assist he up that last hill, she will love it. Thanks again! Sorry for the delayed reply here Glenn! I’ve been traveling and a bit behind on comments and posts of late. Yes, I do think that the Trek Verve+ will handle the 12% grade, especially if she’s under 150 lbs. I weigh ~135 lbs myself and haven’t had any issues with climbing as long as the bike is shifted into a lower gear (which means you go slower) and the assist level is up high in Sport or Turbo. 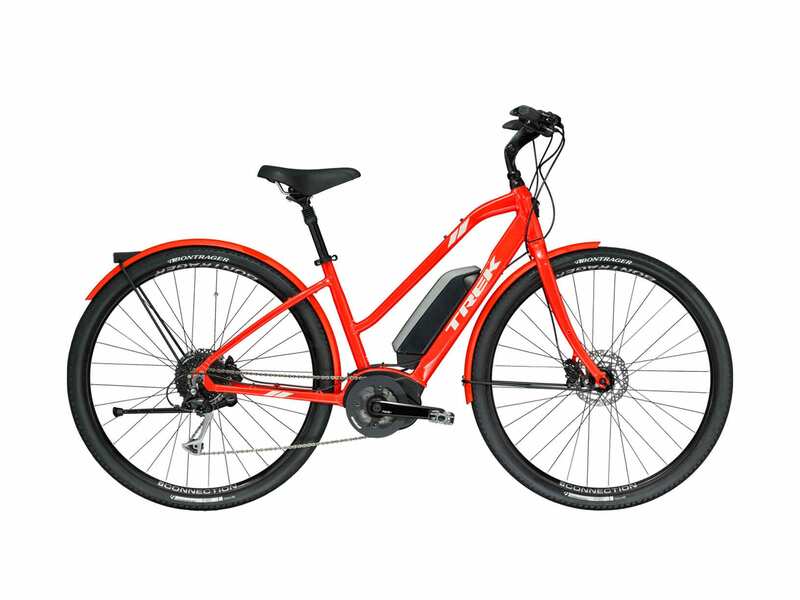 Even though this ebike uses the Active Line motor, it is still VERY capable when used appropriately with the 9-speed cassette :) please share back if/when you guys buy this bike and get a chance to test ride together! Thanks for the detailed reply. 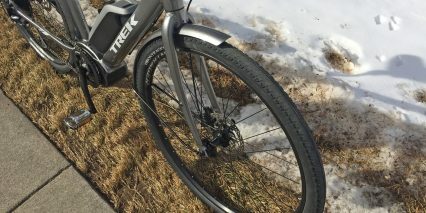 The Trek Verve + sounds like it is a very capable e-bike. I went to my LBS “Trek Bicycle Sacramento Midtown” last Friday to buy the Trek Super Commuter +7 (for me) and the Trek Verve + Step Through (for my wife). I was able to pick up the SC +7 but the Verve + was out of stock and evidently Trek has a 1 1/2 to 2 month backlog. 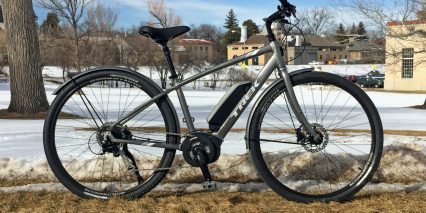 The crew at the Trek store was very helpful and were able to work out a great deal for us on the SC +7 and an Electra Townie Commute 8i for my wife, which they ordered and could get in 1 week. I will post comments on the EBR review sections for those two bikes. I think she will be very happy with the Electra Townie Commute 8i. Thanks again. I was not able to activate the walk feature, but will try again after reading another post saying it now works. This is a GREAT review and I loved your very comprehensive video. Thank you so much! I just purchased this bike and now have to patiently wait for delivery. It is back-ordered! So, I now own this bike and I love it! This is coming from someone who has traditionally not liked bike riding. An ebike takes away all of the “pain points” that I used to have with riding bikes — mainly hills. One thing that I love, too, is that it’s so much easier to ride an ebike in high traffic situations b/c you can get up to speed from a complete stop much faster. On to the Trek: I rented another ebike before I purchased the Verve. One thing I like about the Verve is the amount of power it produces. The bike I rented produced too much power on the 2nd setting. I felt out of control very quickly. This bike is super comfortable to ride , with the exception, perhaps of the saddle. It’s just “ok”. 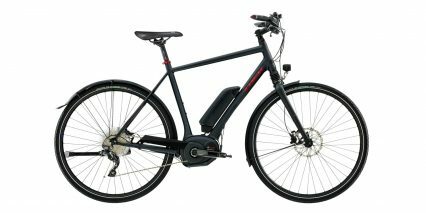 This is a great bike for someone who wants to use an ebike for commuting, running errands, pleasure riding. I put a rear rack on the bike and have a grocery pannier and it’s been a pleasure to start biking for some errands rather than driving. Hey Court, thanks for this great review! I’ve spent so much time researching (mostly through your reviews and forum, so thanks again! ), and I think I may have narrowed it down between this and the Raleigh Misceo iE Sport 2017 which is just $1,699 right now. On one hand the Raleigh looks like a pretty good deal, but on the other, I do like the Verve specs overall. Care to weigh in? Question Court : If you could have your choice of the 2018 Verve + or the the 2018 powerfly 5 for the same price which would you take ? I just took the Verve+ for a test ride yesterday and loved it, but am wondering if it’s powerful enough for kid hauling. My current set up has a Yepp seat on the back rack for my 3 year old, and a follow-me tandem on the back axle for towing my 6 year old when he’s worn out or the roads are too busy. I’m considering an e-bike because of a steep hill that is often fun on my road bike but impossible with little passengers (and leaves me looking rather a mess on arrival). Do you think the Verve+ can handle the extra work of carrying kids and their cargo? 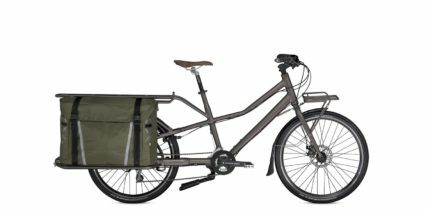 Or should I be looking for more of a cargo bike, or even another ebike with more torque? Thanks for any feedback! Great question, Sarah! There are lots of variables to consider here, but yes. I do think that if you shift to the lowest gears and bring the assist level all the way up, this bike would be able to tackle moderately steep hills without leaving you exhausted and sweaty. 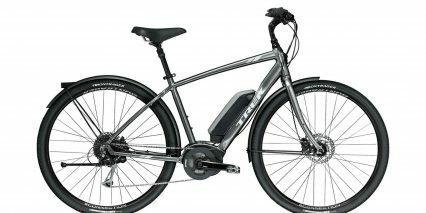 There are indeed, more powerful ebike motors out there (like the Bosch Performance Line), but they add to the cost and weight of the bike. I’m not sure how heavy you and your child are, because weight does make a difference, but the motor is very capable when operating in combination with bike gears. This has a lot more to do with how you ride than how the motor performs alone. 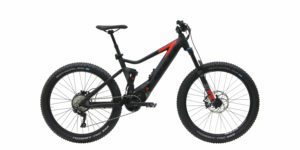 As a fairly active rider myself, I strongly prefer a lightweight nimble ebike like this than a heavy V8 type of setup. 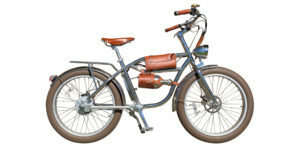 However, if that’s more of what you want, consider moving up slightly in power to the Electra Townie Go models or a lot with a Pedego or Electric Bike Company model. Is there any suggestions to help new knee cap pain while using recently acquired Verve+ ? I’ve tried adjusting the saddle height and moving it back and forth. Noted that the Verve+ crank arms are 5mm longer and distance between pedals are wider than my road bikes. Never get knee pain on road bike. Hmm, I’m not a doctor but the first things that crossed my mind were IT Band tightness in your legs… perhaps you’ve been riding more frequently or further? Maybe pushing harder or perhaps the saddle and pedal position are creating an angle in your hips and knees that is causing pain? Might be worth visiting the bicycle shop for proper fitting and maybe consider your shoes? I’m interested to hear back as you work through this. My own knees tend to be sensitive when riding bicycles up steep hills or hike down hills or walk down stairs but I started Glucosamine Chondroitin and MSM joint relief supplement daily to help. I think it does help, do you do anything like that? Hi Court, just discovered your website in my research for the purchase of our first electric bikes and I have to tell you how terrific your reviews are in hitting every point of consideration. 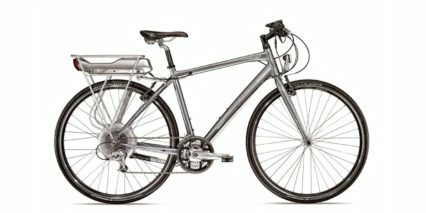 We have narrowed our search down to this model (Trek Verve +) and the Electra Townie Go 8i. I am 5’10” and my wife is just under 5’2″ so it seems like we can get a better fit on the Verve given the various size choices. 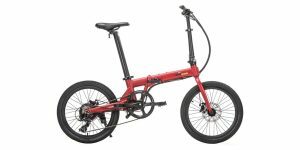 The Townie seems more comfortable with its flat foot technology, but we are also looking to get the exercise benefits (had to stop running due to hip/knee issues) so any input is appreciated. Wonderful! Thanks for the encouragement and great feedback Rande. I definitely work hard on these and do my best to be thorough and accurate. 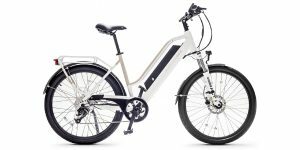 Both of the ebikes you’re considering are great. The Verve+ is my personal favorite because of the value price point, additional sizes, and great accessories. 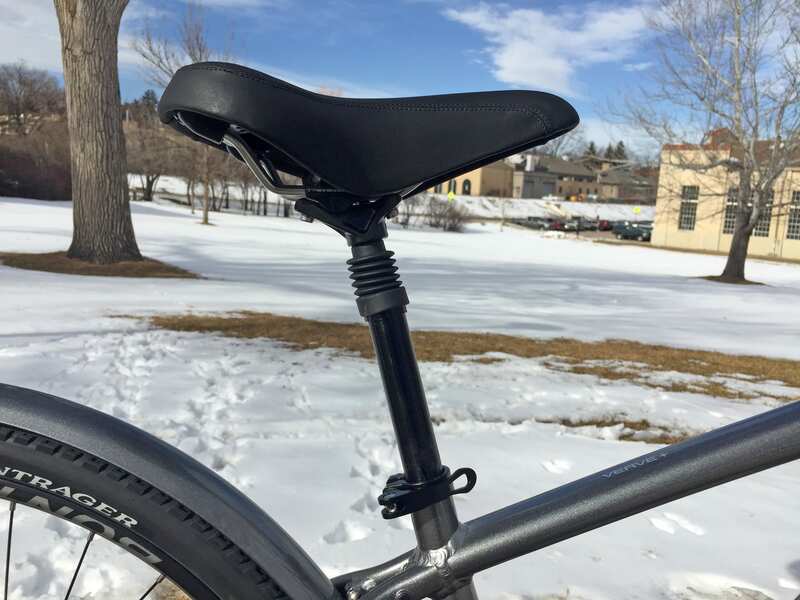 You’re correct that it is not as relaxed as an Electra Townie Go, but the seatpost suspension helps and it will be fine if you’re mostly on smooth paths and streets. it’s actually more comfortable to pedal with because it’s not a flat foot design, and the sporty saddle won’t chaff your legs. It sounds like you’re fairly healthy, and it will be wonderful to ride with your wife. 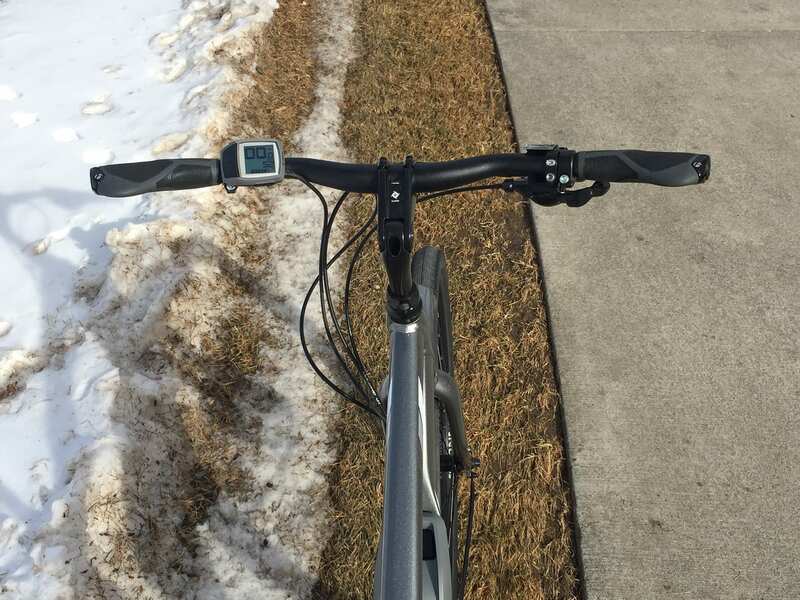 I got into ebikes because of knee sensitivity, so I feel like I can relate to your situation. I think you’ll be very happy with the Verve+ but it would be great if you could test ride both! 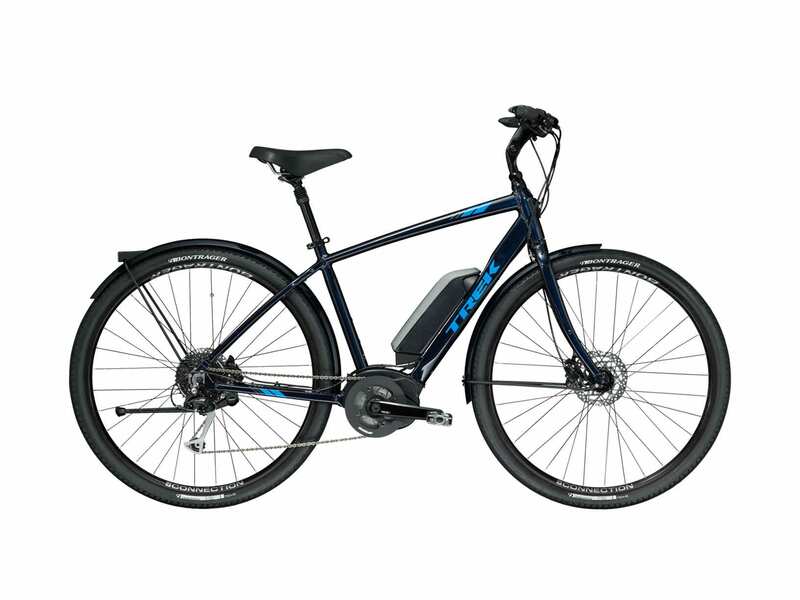 Most Trek dealers also have an Electra Townie (even if it’s not electric) that you could sit on and get a feel for. Try to visit a dealer if you can :) I’d love to hear what you choose and how it works out for you two someday! 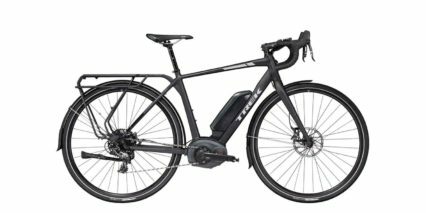 I’m trying to decide between The Trek Verve+, The Gazelle Medeo T-9, and the Aventon Pace 500. 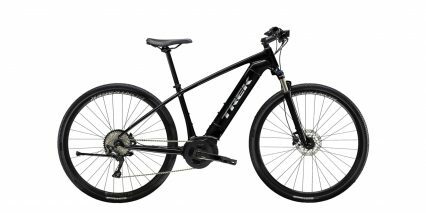 I really like the lightness of the Trek and the Hybrid aspect to ride on packed dirt trails, and the hydraulic brakes, but also like the more powerful motor of the Gazelle and really like their color selection and its appearance much more. Any advice between those two? I’m test riding the Aventon as well this weekend. Thanks so much for your helpful previews.